Every time we look at a new implement or piece of furniture in the tabernacle, at first we might think, “What is this even here for?” Until we look for and find Christ in them, they don’t seem to make any sense. But as soon as we open our eyes and minds to what we are being shown about Him, it all becomes so clear. Today’s verses may not all make sense to you yet, but even before reading them, we can make a few logical deductions about what they must picture. For example, we have incense. Pretty much everyone knows what incense is and what it is for. When you light it, it smells good, it smokes, and the smoke rises up and out of sight. If we understand the significance of the burnt offerings from previous sermons, we should at least get a hint of an idea what this incense must then be picturing. If so, then everything else should naturally begin to fall into place as well. Job noted that God isn’t a man. Because of that, there was no way for Him to talk directly to Him and get an answer from Him. And so he hoped for a mediator to help him out, someone who could bridge the gap between finite him and infinite God. This is what he desired. Incense goes up from its place and eventually diffuses into the heavens. It pictures that transition which Job longed for. If his prayers could just go up and be received by a mediator who was qualified to take them in and pass them on, then all would be AOK. Likewise, if we were sure that our prayers were so handled, then we would surely know that everything is AOK. Well, guess what. If you know Christ, then everything is AOK. It’s all to be found in His superior word. And so let’s turn to that precious word once again and… May God speak to us through His word today and may His glorious name ever be praised. The altar now to be described gets its name from these words, mizbeakh miktar qetoret – “altar to burn incense.” The word qetoret, or incense, is from the same root as the word qitor, meaning “clouds” or “smoke.” Thus it means, “smoke, odor of (burning) sacrifice, incense.” However, the altar will also have a different name ascribed to it which we will see in a bit. There are quite a few things about this altar which are perplexing to scholars, but if we simply take each verse, one at a time, and consider what we already know from the description of the other tabernacle furniture, we’ll will have very few problems with the details. 1 (con’t) you shall make it of acacia wood. Like much of the other furniture, the base material of this altar is to be acacia wood. Without going into all of the detail of the past, a short description of acacia and its properties will suffice as a good reminder. It is a very slow growing tree that would be readily available in the area where they are. Its heart wood is dark reddish-brown and is beautiful when sanded and polished. It is resistant to decay for several reasons and thus it is considered an incorruptible wood. An ammah, or “cubit,” comes from the word em, or “mother.” Thus it is the mother measurement. It is the distance from the tip of the middle finger to the bend in the arm at the elbow. Thus this will be about 18 inches and…. So far, we have seen that the Brazen Altar and the Breastplate of Judgment were both square. The altar carried the idea of judgment. The breastplate signified judgement and intercession. This third square piece will logically follow as intercession then. The Breastplate of Judgment is what ties the judgment of the Brazen Altar and the intercession of the Altar of Incense together. The fact that this is square, like the other two implements, signifies that the scope of the intercession reaches to the four corners of the earth without distinction or interruption; it is without limits. 2 (con’t) and two cubits shall be its height. 2 (con’t) Its horns shall be of one piece with it. If you noticed, the number of horns is given for the brazen altar, but the number of them is not given here. There must be a reason for this. Again, like the other wooden implements, this one is to be overlaid. The word is tsaphah, and it is identical to the verb tsaphah, which means “to look out or about, spy, keep watch.” Unlike the Brazen Altar, this one is to be overlaid with zahav tahor, or “gold pure.” It is the same overlay as that of the Ark and the Table of Showbread. Thus it will carry the same significance here as it did for those. One new word introduced into the Bible here is gag, or “top.” It is probably by reduplication from the word ga’ah, which means “exalted. And so by analogy it is the top of an altar, house, etc. 3 (con’t) and you shall make for it a molding of gold all around. The zer or “molding” was introduced with the Ark of the Covenant. One was also prescribed for the Table of Showbread. Now, a third implement is to be given such a molding. Like the Ark of the Covenant and the Table of Showbread, this molding is lacking the adjective “pure.” Although the overlay is specifically said to be pure in all three, the same adjective lacks in all three concerning the molding. Because of the complete covering in gold, and this golden molding at the top, this altar will also be known as the “Golden Altar” in Scripture. It is first called this in Exodus 39:38. 4 Two gold rings you shall make for it, under the molding on both its sides. Like the several other pieces, this is to have rings attached to it. And like the other gold pieces, the rings for this one are also lacking the adjective “pure.” They will carry a similar signification as the other times they were mentioned. The word for “ring” is tabbaath. It means “ring,” but it comes from another word, taba. That is a verb which means “to sink.” This then gives the idea of a signet ring which is sunk into clay or wax in order to make a seal. From this comes the idea of any ring. Unlike the Ark and the Table, the rings for this Altar are to be under the molding. It will be carried with only the top of the Altar elevated above the priests. 4 (con’t) You shall place them on its two sides, and they will be holders for the poles with which to bear it. Unlike the other furniture with rings and poles, this one has only two rings. They are made of gold and under the molding of the table. They will be used for holding the poles that bear and transport the altar. Again, exactly as has been seen in the previous instances, these badim, or “poles,” are to be of acacia word and overlaid with gold. And again, just as before, the adjective “pure” is lacking from the description. 6 And you shall put it before the veil that is before the ark of the Testimony, before the mercy seat that is over the Testimony, where I will meet with you. This Golden Altar of Incense was to be put directly in front of the veil, in the middle of the holy place between the Table of Showbread on one side, and the Menorah on the other side. As it is said to be “before the ark of the Testimony,” it indicates that the ark and it are intricately connected. However, it also says, “before the mercy seat.” Therefore it is also intricately connected to that. It is tied to both individually. Finally, it says that it is “where I will meet with you.” This is speaking of the presence of the Lord above the Mercy Seat, between the cherubim on it. In this verse, there is a play on words occurring which is provided to give insights into the work of Christ. The veil, or paroketh, comes from the word perek which means “cruelty” or “rigor.” That then comes from an unused root meaning to “break apart” or “fracture.” In this, we can see where cruelty or rigor then comes into play. On one side there is cruelty and rigor; on the other side, there is mercy, or satisfaction. The only thing that would pass through this veil each day would be the smell of the incense as it wafted into the air. 7 (con’t) when he tends the lamps, he shall burn incense on it. When the lamps of the Menorah were trimmed at morning time, the incense was to be burned on it at the same time. This says “Aaron,” but it is the priesthood of Aaron which is implied. Whatever priest was given the responsibility could do this. We know this from Luke 1:9-10 where Zechariah, the father of John the Baptist, was given this privilege. As far as the burning of the incense, it is unknown how it was done. Some scholars see this altar as having a grating where the ashes would fall through. Nothing is said of this. Some scholars see the incense as being brought in and burnt on a golden censer. This seems more likely, but it is still only speculation. As it is not stated explicitly, it is not the focus of the details. That incense is burned on the altar is. As in the morning, Aaron was also to burn incense on this altar at twilight, or literally ben ha’arbayim, “between the evenings.” These then are at the same times that the morning and evening sacrifices were to be made on the brazen altar. The two are being linked together in a unique way, just as this altar is linked to the Ark and the Mercy Seat in a unique way, and just as this altar and the Menorah are being linked together as well. Everything is tying together in the details of this special Altar of Incense. 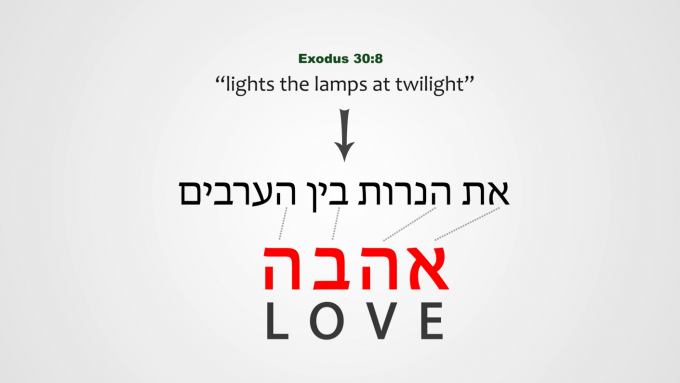 As a bonus for you which is found in the words eth hanerot ben ha’arbayim, or “lights the lamps at twilight,” the word “LOVE,” or hava is found in a reverse acrostic of these words. The first letter of each word – aleph hey beth hey spells a reverse acrostic hava, or LOVE. 8 (con’t) a perpetual incense before the Lord throughout your generations. 9 You shall not offer strange incense on it, or a burnt offering, or a grain offering; nor shall you pour a drink offering on it. The specificity here is given because the word for altar, or mizbeakh, is the same as for that of the Brazen Altar. It is an altar, it is square, it has horns, etc. just like the Brazen Altar. Even the rising of the smoke from the different offerings uses the same words for the Brazen Altar and this one. Because of this, prohibitions were required to avoid confusion. No strange incense was to be burned on it. This means that only the prescribed incense given later in this chapter was to ever be burnt. No burnt offering of any kind, no grain offering of any kind, nor any drink offering of any kind was to be offered on this altar. Finally, the fact that the offerings for both of these altars was to be made at the same time is showing a special connection between them. As the smoke rises from one, so it would rise from the other. This Altar of Incense is so uniquely tied to so many other items in the tabernacle that its importance cannot be downplayed in any way. 10 (con’t) once a year he shall make atonement upon it throughout your generations. The entire altar would be considered purified from uncleanness by this annual atonement provided by the high priest. He was wise to say that there is no reason to suspect a dislocation of the text. In other words, it wasn’t an accident being placed here. He just doesn’t see the logic of why it is, in fact, placed here. Well, there are several good reasons why it is. The first is that the earliest items recorded tell us of Christ coming to His people in order to bestow mercy and grace on them. However, this item now shows us what God has done in order for us to go to Him. This will be seen first and foremost in what the incense pictures. Secondly, the details of the selection, ordination, and consecration of the priests was detailed in chapters 28 & 29. It would make no sense to speak of the things which the priests would daily minister to until the priests were prepared to minister. The care for the lampstand anticipated the ordination of Aaron; the daily offerings and the ministration of the Altar of Incense, confirms that same ordination. Thirdly, there is a lesson concerning ourselves in relation to the Altar of Incense. The Altar speaks of Christ, but in a second sense it has an application in the people of Christ. It relates to our relationship with God through Him and our duties to God because of Him. The burning incense pictures prayer. But prayer is intimately connected to praise, and so it has that secondary meaning adjoined to it. The next thing described is the base material for the altar, acacia. Just as before, it pictures Christ’s humanity. The wood is incorruptible, just as He is. Therefore, the prayers of intercession of Christ are unified and they hold primacy. In other words, prayers to God can only be offered through this One Source. No other prayers are acceptable to God without going through His chosen Mediator. So much for the RCC’s prayers to Mary. The height being two cubits means that it is one half cubit taller than both the Ark and the Table of Showbread. It is exalted above those. The Ark is Christ embodying the law, meaning the Testimony which stands for the entire law. The Table of Showbread reveals Christ our Bread who gave His life for us. Only in the fulfilling of the law and in the giving of His life can we stand justified and acceptable before God. Bullinger shows that two “..is the first number by which we can divide another, and therefore in all its uses we may trace this fundamental idea of division or difference.” There is a fundamental difference between acceptable prayers and unacceptable prayers. Only those prayers which rise above the law through the completed work of Christ can be considered acceptable to God. Those which do not, are not. The qarnotav, or “horns,” were made to grow out of the altar, just as a horn grows out of the head of an animal. They are a symbol of power and strength and demonstrate the intercessory power of Christ to God for us. As they are one with the altar, then everything about this altar is typified by His power. That the number of horns is not stated is a significant omission. As four is the number of creation, the Brazen Altar having four horns signified the judgment on sin throughout creation. However, because Christ’s intercessory work is in heaven, no number of horns is given. Thus there is a transcendence from the earthly to the heavenly in this omission. The overlay of the wood with pure gold signifies Christ’s perfect purity and absolute divinity. It also symbolizes His kingly status. He is the priest-king. Therefore, it signifies Christ’s divine ability to keep watch over those He intercedes for and mediates for. Just as a king watches over His subjects, so Christ our King watches out and for us. The word of God, given through the Holy Spirit, is represented by these two rings. They are the number of “witness.” They “speak of the Spirit’s testifying of Christ.” They testify as the seal and authority of who Christ is. The first mention of this by Jesus was when He spoke of the Old Testament Scriptures. The second mention of it was when He spoke of what would be given to the apostles for the New Testament. Both are of divine origin, meaning from the Holy Spirit, but both have since been handled by man and therefore the adjective “pure” is not used. They have our taint in them, even if they are the inspired word of God. Though the word of God is pure, man’s hands and his fallible interpretations have been used in the process of sharing it. The lacking adjective is no mistake. Instead, it is another picture for us to understand. It is to these two rings into which the poles are placed. These then are the two testaments themselves, the New and Old. They speak of the God/Man, represented by the wood and gold. They are what makes Christ mobile to the world as their word carries Him, each contrasting – the law and grace, but each supporting the whole and confirming the message of Him. As the table can only be carried by two poles, not just one, it teaches us that should either or both testaments of the Bible be removed, we would not have a proper presentation of who Christ is. Without one or the other, we would have a faulty view of Him, and without either, we would have no knowledge of Him at all. As these poles and rings are just under the molding of the altar and not at its feet, it shows us that Christ’s intercessory work for us is near and close to us. He is our ever present help in time of need. That the Altar is directly before the veil and before the Ark and the Mercy Seat, it shows that even though we are still on this side of the veil, living in this fallen world, our prayers are acceptable to God because of the embodiment of the law and the satisfaction of that law for us because of the torn body of Christ, which is the veil. This unique arrangement of the Altar, Veil, Ark, and Mercy seat shows us that even though we cannot see heaven and the throne of grace with our eyes yet, our prayers are still received because of Christ’s work. This is why there is that play on words concerning the Veil and the Mercy Seat – the paroketh and the kapporeth. On our side, we walk in a world of cruelty and rigor. On the other side, where our hope lies, there is mercy, and satisfaction. As the smell of the incense would waft through this veil each day, so our prayers pass through to the throne of God. It is the incense of the altar passing through to God where mercy is made available to the sinner, and where grace is bestowed upon the believer. The change in the letters of paroketh and kapporeth shows that our sins are scattered on one side, being blown away. This is signified by the letter pe. On the other side, there is an open hand, allowing our prayers to be received, signified by the letter kaph. If you have ever wondered if your prayers are really heard by God, these ancient pictures show that because of Christ, they are. It is there at the seat of mercy that we now meet with the Lord. The burning of the incense at the time of the tending of the lamps shows a direct connection between the two. As the lamps picture the illumination and ministry of God by the Holy Spirit, which is the Spirit of Christ, it is a direct consequence of Christ’s intercession for us. As we pray, He intercedes, and therefore the Spirit responds. But there is more. The timing of the two burnings is not only connected to the Menorah, but it is the same time of day as the morning and evening offerings on the Brazen Altar. The Brazen Altar sacrifices speak of the consecration of the life and actions of the body and soul to the Lord. They make a satisfaction for that which was displeasing to God. The Altar of Incense offering speaks of the spiritual side of man being consecrated to the Lord. This tells of divine acceptance of what is pleasing to Him, namely our prayers because of the work of Christ. Where the Brazen Altar sacrifices express atonement and reconciliation, the Altar of Incense offerings declare intimate fellowship with God because of that atonement and reconciliation. The two offerings both complement and complete our daily spiritual interaction with God in both act and exclamation. And finally, the timing of the two offerings are aligned with the timing of Christ’s final day in His earthly ministry. He was brought before the leaders of Israel and the Gentiles in the morning, and crucified between the evenings at the same time as these offerings. Thus they are a constant reminder to God of the work of Christ on our behalf. It is no coincidence that the acrostic hava, or LOVE is found in the words “lights the lamps at twilight.” This is the time of day that Christ died on the cross. The love of God, seen in the death of His Son, is what made our prayers acceptable to Him once again. This is the LOVE of God which is found in the High Priestly ministry of Christ’s cross. Jesus, the Light of the world, illuminated both heaven and earth with the splendor of His work. Because of Him, we now have intimate fellowship with God through the offering of our prayers and praises. The admonition to not offer strange incense upon this altar shows that the only prayers which are acceptable to God are those prayers which meet His exacting standards. No other prayers are acceptable except those authorized by and through His word. It is a note of exclusivity for the believer in Christ. It is also a note that the follower of Christ is to never mingle his prayers with the prayers of unbelievers. That would be to mix the holy with the profane. It is an abomination to God. The admonition to offer no other offerings of any kind on this altar indicates that only through the work of Christ, which is realized in the other implements of the tabernacle, are prayers acceptable to God. We can add no works of any kind into our complete devotion to Christ. Rather we are to trust in His sacrifices and offerings alone when we submit our prayers to God. In other words, even our prayers are defiled because we are defiled. The atonement upon the altar shows the need for Christ’s continued intercessory work for us. Though we are deemed acceptable to God because of Christ, it is only because of Christ. Without His past work, our prayers would be unheard. Without His on-going work, our prayers would continue to be unheard. The annual atonement of the altar shows that the virtue of Christ’s intercession is fully complete by His earthly suffering, once for all time. We need nothing else, no sacrifice of any kind, to be acceptable to God. Instead, we need only our true Intercessor, Christ Jesus. Such is the marvel and the majesty of Jesus Christ. Not only did He save us, but He keeps saving us. Not only did He purify us, but He continues to do so. And they fell on their faces. If you’re like me, and you wonder why God doesn’t just strike you dead and cast you into the pit for the things you do, now you can see why. Christ is there. He is that Altar and He is ever interceding for you, even when you blow it in a major way. As a life application concerning what this altar signifies, we can discern from it three major precepts which we can apply to our life. The first is that it shows us just what prayer is. Incense is something that needs to be lit in order to smell. Unless the fire is kindled it just lays there, useless. But once it is lit, it begins to smoke and to smell sweet. It then arises towards heaven. Likewise, unless we have a fire in our heart concerning our prayers, they are useless. They are vain repetitions without any fragrance. But if we are fervent in our prayers, they will rise in a smoke of wondrous joy to the Lord who is delighted to hear them and respond to them. Secondly, the placement of the altar should be a clue as to where prayers belong in our lives. We first have to come to Christ through His sacrifice. Only then are our prayers acceptable to God. Sin must always be dealt with before our prayers can be responded to. As the altar of incense is in the Holy Place, it is before both the Menorah and the Table of Showbread. The Menorah shows that we are to be a light to the world. That the Menorah illuminates the side where the Table of Showbread is, it indicates that we are to illuminate the work of Christ, our Bread of Life. The Altar of Incense stands between the two. It teaches us that our light will be ineffective and our proclamation will become stale and moldy without an effective prayer life. Both are hallowed by the presence of the Altar of Incense in our lives. As it stands before the veil, it shows that our prayers must reach into the most holy place by going through the veil. As Christ is the veil, our prayers must be offered to God through Him. When they are, they reach the Throne of Grace and the Seat of Mercy. Though we are in a land of cruelty, our prayers raise even to the seat of heaven because of Christ.